Good morning beautiful, how was your night, mine was wonderful with you by my side. Well, those of you who have not heard that famous song, it's a good one, but my night was just not quite as good. Does anyone else have these problems? yes, this is MY bed. 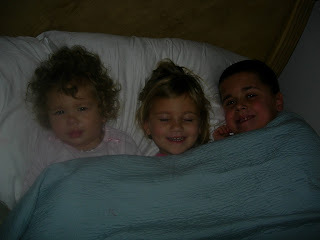 It started with Presley at about four-ish, then by five we had three girls in, and by six Conner joined us And of course no one ever went back to sleep, how much fun would that have been? loads, i know. So, it was Saturday and the kiddos wanted something special for breakfast, and they wanted to make it. 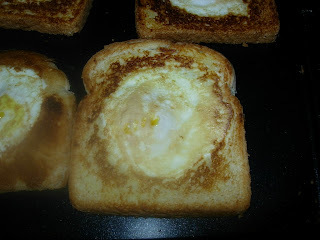 One of our fun things to eat on a Saturday is egg-in-toast. 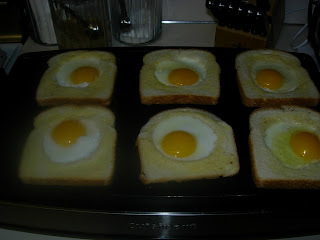 Simply stated, you butter both sides of the bread, cut a hole in the middle with a cup, and crack the egg in the middle. Sound gross? It's so good. You let it cook till brown on underside, then flip, carefully. All done, egg and toast all in one. less mess, and kids get a kick out of cutting holes in the bread. 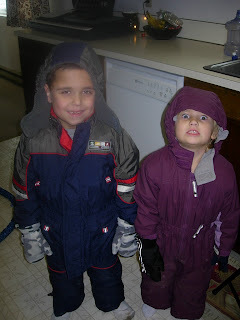 After breakfast, it had snowed and the kids were soooo excited to go play in it. there wasn't much, but they had fun. Taylor was a little skeptical at first, but Conner showed her the ropes. 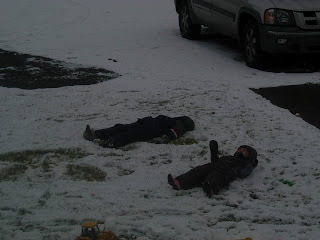 Snow angels, a classic. Kids, snow, hot chocolate, all so much fun. Hopefully we get more snow, so we can build snowmen. they tried, but it was a very little snowman. Angels they all are. whether it's four, five or six in the morning. 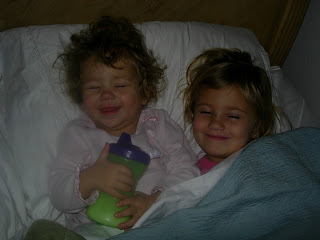 cute kidlets Jenica! I remember those days! We finally bought a king size bed so we might be able to sleep a little longer. I am glad you are taking lots of pics-too soon they will be sleeping in til noon and won't go outside to play. My 4 year old likes to come into my room NIGHTLY. it used to be just the weekends (She says "on hang out days I sleep with Mommy & Daddy on School nights I sleep in my bed") Not so much anymore. And I Love the egg in the toast thing, I can't remeber the last time I did it.. I know what we are having for breakfast tomorrow!